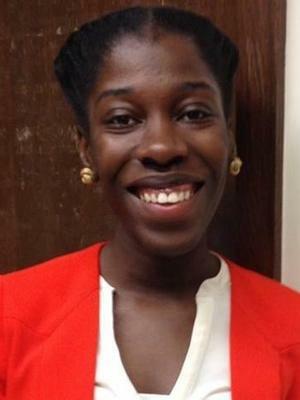 Sherita V. Roundtree is a PhD candidate in the Rhetoric, Composition and Literacy program at The Ohio State University. She holds degrees in English secondary education from Salisbury University (BA) and in composition and rhetoric from the University of Nebraska, Lincoln (MA). She has taught various composition courses, facilitated community workshops, co-taught a graduate teacher training course and served as a writing center tutor at several university and community sites. Sherita’s research lies at the intersections of composition studies, Black women’s rhetorics and writing program administration. Her dissertation project centralizes the practices and experiences of Black women graduate teaching assistants (GTAs) who teach or have taught first- and/or second-level composition courses. More specifically, Sherita seeks to better understand Black women GTAs' feelings of preparedness (or what factors have contributed to their feelings of preparedness) to teach first- and/or second-level composition courses. When not working on her dissertation, Sherita co-facilitates a writer's workshop with kids/teens and volunteers at the Homework Help Center at a Columbus Metropolitan Library location. She create activities that explore the relationship between design/art and literacy as a means of getting kids/teens more invested in writing.